Join the Village life of the Maronite Catholics in Kormacit! In the morning we visit the Güzelyurt Weekly Market with typical Cypriot products like bread, Halloumi, Sucuk, etc. Afterwards we continue to the Church of Saint Mamas, where we visit the icon museum and the nearby archaeological museum with its newest discoveries such as ‘’The Golden Leaves of Soli’’. From there we drive to the village of Kormacit, where the spoken languages are Greek and Aramaic (original language of Jesus Christ). The inhabitants are members of the Maronite Church, which is a Catholic Church based in Lebanon. 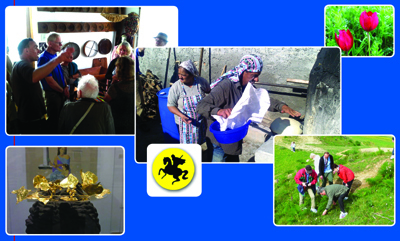 There we learn how to make bread, Halloumi cheese or Carob cake and participate actively (hands get dirty!) in preparing today’s lunch. We also visit Citrus Gardens (oranges, mandarins, lemons, etc.) and a Mini Farm with typical Cypriot animals (donkeys, horses, goats, etc.). Afterwards we share the Maronite way of enjoying life sipping a homemade glass of wine. Yiamas! • Minimum group size: 4 persons. Cancellation from SIDETOUR is possible until 18:00 on the day prior to the tour. Refunding follows in your hotel.